Tell us a bit about the Farah Talib Aziz brand philosophy? Farah Talib Aziz’s work exuberates effeminate opulence, garnished with her signature embroidery and floral motifs. Her design philosophy is to magnify femininity, with the help of regally draped cloth and expert artisans, while maintaining a form of elegant sophistication. Stunning audiences with intricate detail and a strong sense of beauty, Farah Talib Aziz creates luxe classic pieces that modernize traditions while highlighting feminine appeal. Coming from a background in textiles, Farah herself is highly talented and trained in tailoring and embellishments. Regularly updating her skills, Farah has first hand expertise and knowledge about the production methods. She has a commendable ‘hands on’ approach to the brand and emphasizes on keeping quality standards high by using the purest materials and finest tailors. How is this philosophy translating into lawn, this season? At Farah Talib Aziz we’ve always had a very strong aesthetic that runs through all of our creations, from cottons to bridals our focus is to highlight femininity and elegance with the use of intricate classic embellishments and blossoming fresh color choices. Our signature traits of soft feminine colors and floral motifs are used to make women of all ages feel beautiful and confident in our designs. Similarly our Lawn collection draws on classic European inspirations, especially the serenity of French country florals and laid back glamour of old Parisian lifestyle. Was lawn always the plan? As a label we have always been quite private, operating from our studio with limited commercial presence and activity. Our work speaks for itself, Alhumdullilah, as we have never even been on the ramp. Given the nature of the brand, lawn was definitely not the plan. We had been approached by a few mills previously that proposed a similar venture, however we chose to work with the Lakhany Silk Mills given their strong reputation and high quality standards. 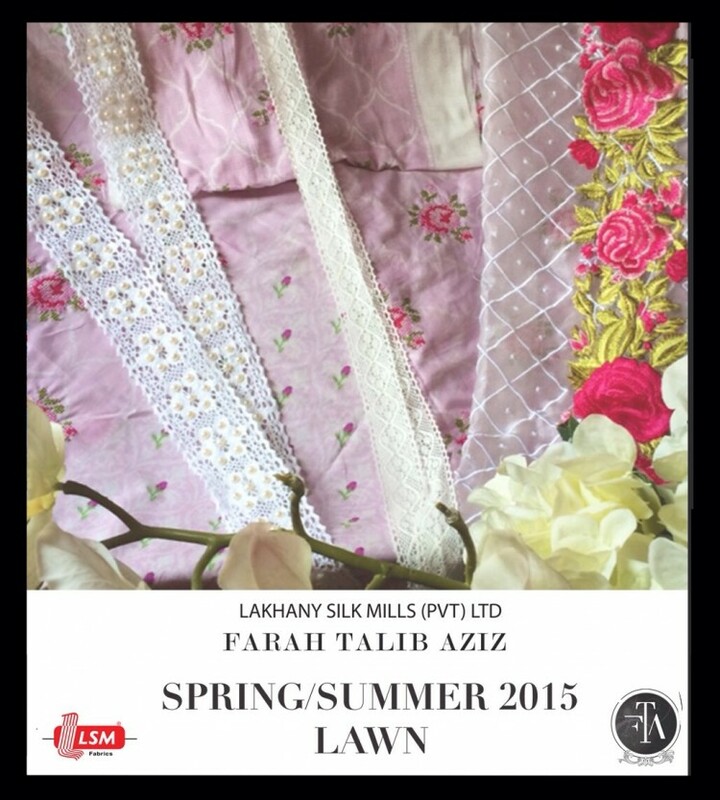 What we should expect to see from the brand in terms of lawn this season? For our Spring 2015 collection we have drawn inspiration from the charm of French country florals and the grace of old Parisian lifestyle, encompassing the delicacy and glamour of European heritage and the celebration of feminine splendor. We have diffused the Farah Talib Aziz aesthetics of delicate florals, intricate embroideries and flattering silhouettes with the use of bold patterns on a bed of soft summer shades to create a collection that appeals to women of all ages and backgrounds.